Recently there have been some new articles concerning the benefits, and perhaps downsides, of limiting one’s salt (sodium chloride) intake. 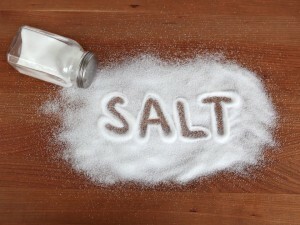 We know that high salt in one’s diet can contribute to high blood pressure. We know that people who have heart problems such as congestive heart failure, hypertension, or severely impaired kidney function may need to limit their salt intake. We know that countries in the world that have the highest salt intake often have the highest rates of cardiovascular disease. So it would seem logical to infer that, globally, if we all lowered our salt intake, there would be a reduction in cardiovascular complications such as heart attacks and stroke. With that in mind, the American Heart Association and the CDC have recommended a very low (2.3 grams of sodium per day or less) diet for all. If you are over the age of 50, African American, hypertensive, or diabetic, they recommend further limiting your total sodium intake to 1.5 grams or less. To keep that in perspective, the average American takes in more than twice that amount (3.4 grams according to the CDC). For most people about a quarter of their sodium intake comes from the salt shaker and three quarters from “processed foods” including most canned vegetables, soups and sauces; these have added sodium, which enhances taste and texture, and acts as a preservative. Ditto for breads and rolls. Fresh and processed poultry and cold cuts are typically high in salt content as well. Restaurant foods and, of course, potato chips and pretzels are sources of excess salt and sodium. Preventing cardiovascular disease is certainly a worthwhile endeavor. Unfortunately, when subjected to scientific scrutiny, many commonly accepted preventative interventions other than lifestyle change such as exercise and keeping one’s weight down have failed to live up to their promises. In previous posts we have addressed controversies about the roles of daily aspirin, saturated fats, vitamin D and others in preventing disease and prolonging life. So what about those recent articles about salt and health? They do confirm that with higher levels of sodium intake (greater than 6 grams per day), there indeed is a higher risk of cardiovascular disease and hypertension. However, one of the articles suggests that for the average person the ideal range of salt intake might be more in the order of 3 to 6 grams per day; and for those who significantly lower their salt intake down to the levels recommended by the American Heart Association there may actually be an increase in cardiovascular disease. The same article also confirmed previously noted trends that higher intake of potassium (as commonly found in fruits and vegetables) may help to reverse some of the adverse effects of salt. While the experts continue to debate the true meaning of these articles, and look to confirm or refute their findings, what are the prudent actions to take? First, try and take an inventory of how much salt you consume on average. Learn to read labels. If your daily salt intake is 6 grams a day or more, all the studies indicate that your health is potentially being jeopardized; and you should strive to reign in your salt intake. If you do need to be on a lower salt diet studies have shown that people are much more successful if another family member consumes the same diet. Try and increase your fruits and vegetables which will help keep your potassium levels up and also help you keep your weight in check. If you are healthy and without hypertension or heart failure, given the above noted controversy among the “experts,” you don’t necessarily need to go on a very low sodium diet – unless directed to do so by your doctor – but continue to exercise, keep your weight down, and improve on your intake of fruits and vegetables. Remember, everyone is different and what is best for one person might not be best for you. The “experts” who make the general recommendations for the population at large aren’t taking care of you personally. If in doubt check with your own doctor. Thanks for another informative blog. I understand your listing cardiovascular disease together with other maladies, but wish you had included salt’s adverse effect on those who suffer with Menier’s syndrome. Having “been there, done that,” I can attest to the smart practicality of a low salt diet, however, from recent study results, it’s hard to say just where that intake level should be. As each sufferer is different, everyone should consult with her or his doctor. Hypertension, impaired kidney failure, cardiovascular disease and other problems are possibly just the tip of the iceberg when it comes to excessive salt intake. But cutting down on salt intake is a sure ‘cure’ for Menier’s attacks… at least for mine. And it beats the alternative… “worshiping the porcelain god” during severe attacks. Feel it should be considered and included together with the other ‘high profile’ problems listed.